I haven’t posted much on here in the last week or so but that’s not to say I haven’t been a busy little bee. First, I forgot to mention a while back that I’ve created a handy new recipe index page which can be accessed through the menu at the top. I didn’t do one to start with because it seemed a bit silly when I only had three recipes on here but the next time I thought about it, I realised that the site had become a bit unwieldy. Hope you find it useful. I’ve categorised it according to type of dish and have also included a section of links to my guest posts over at LiveGlutenFree. I’ve also created a Links page to the websites and blogs that I follow and find useful. I shall talk more about them in the next couple of weeks as I reach my first bloggiversary and reflect on what I’ve learned and the people I’ve (virtually) met! And also I’ve been sucked into Pinterest…who knew that I had even more spare hours in the day to get sucked into that black hole otherwise known as social media! 🙂 Anyway, I’ve started a couple of boards: one called ‘inspirational food photography’, where I’ve pinned some photos that make me go ‘wow!’ and make me feel not a little jealous of the photographer’s ability and kit; and another called ‘glutilicious’ where I’ve pinned some recipes that contain gluten but that no-one’s going to stop me eating so I’ve suggested how I might make them non-toxic. There’s not much on there at the moment but I’m going to gradually add to them. They’re not quite there yet but I have a feeling that it was more to do with the bake, rather than a gluten-free thing. 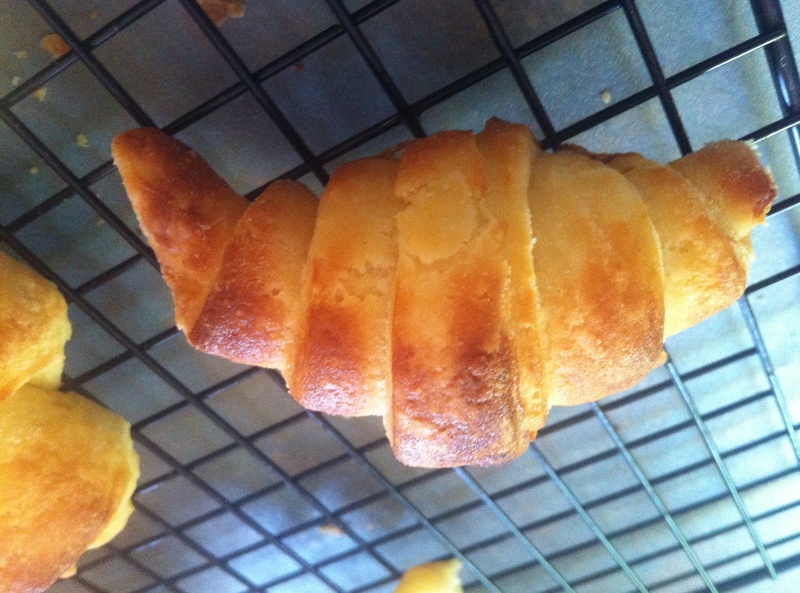 I’m planning to give them another go either this weekend or next, so hopefully I’ll be able to share the recipe soon! Anyway, that’s enough wittering on. 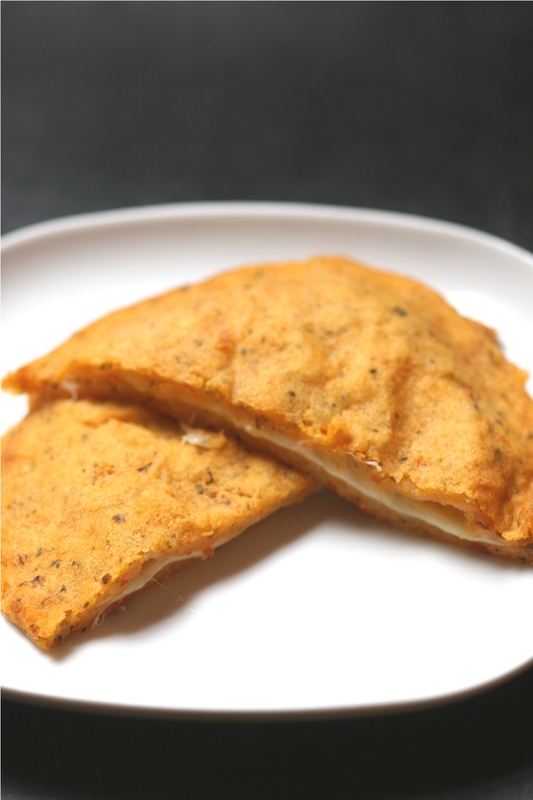 Crespelle ripiene originate in the Campania region of Italy and are generally filled with cheese. This recipe, however, is very versatile. It can have a spinach and ricotta filling or a plain mushroom one. I added the chicken just to ring the changes but I don’t see why it couldn’t also be adapted to any cannelloni or lasagne filling. It’s also an economic recipe – I manage to make one chicken breast fillet stretch to feed four people! First, make the pancake batter. Sift the flour into a large bowl, add the salt and make a well in the centre. Pour in the eggs and 150ml of milk. Using a balloon whisk, gradually incorporate the flour from around the edges into eggs and milk and whisk until a smooth but bubbly mixture is formed. Allow to sit for a couple of minutes and then add the remaining 100ml of milk. Whisk well then allow to sit for 30 minutes. 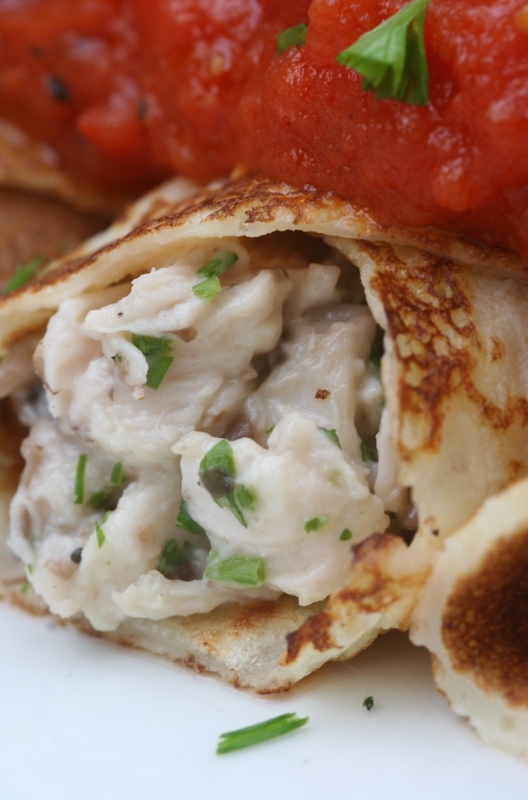 Whilst the pancake batter is resting, make the pancake filling. Heat the olive oil in a large frying pan over a low heat and add the garlic. Fry gently for a couple of minutes until the garlic is just beginning to turn golden. Add the chopped mushrooms and continue to cook gently for 15 minutes, stirring every now and again, until the mushrooms have darkened, reduced and have lost their moisture. Sprinkle the cornflour over the mushrooms and stir until the whiteness of the cornflour has disappeared (make sure any lumps of flour have been broken up with the back of the spatula). Add the milk, stir and bring up to a gentle boil. Simmer, stirring all the while, until the sauce has thickened considerably (several minutes). Take off the heat and allow to cool. 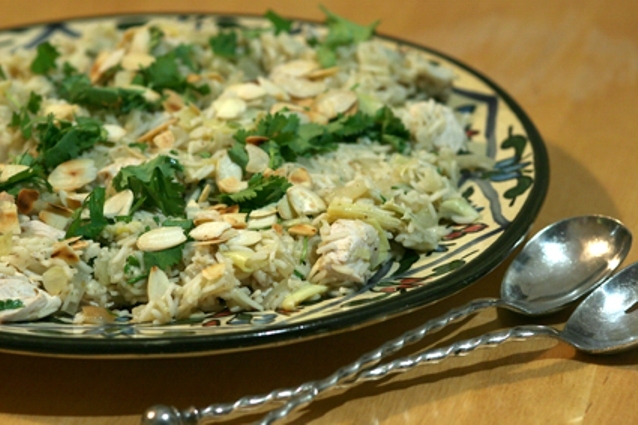 When cool, stir in the chopped chicken and chopped parsley. Set aside. Now, make the pancakes. Put a small frying pan over a medium to high heat and add a splash of oil. When the pan is smoking, add about a third of a ladleful of pancake batter. Swirl the batter around the pan until the base is covered. Cook for about 30 seconds or until small bubbles have appeared on the surface and the underside is a dappled dark golden brown. Carefully flip the pancake using a palette knife and cook the other side for about 30 seconds. Remove to a plate and cook the rest of the pancakes (eight in total), re-oiling the pan when necessary and stacking the cooked pancakes one on top of the other. Allow to cool. Now make the tomato sauce. In a frying pan or large saucepan, heat the olive oil over a low flame. When hot, add the tins of chopped tomatoes, the sugar and some salt and pepper and allow to bubble and reduce to a thick sauce for about 15 minutes. Preheat the oven to 180°C (my oven is fan-assisted, so adjust accordingly). Meanwhile, assemble the pancakes. Divide the pancake filling into eight (or into as many portions as you have pancakes) and put a line of filling down the centre of each pancake. Roll the pancake around the filling to enclose it. 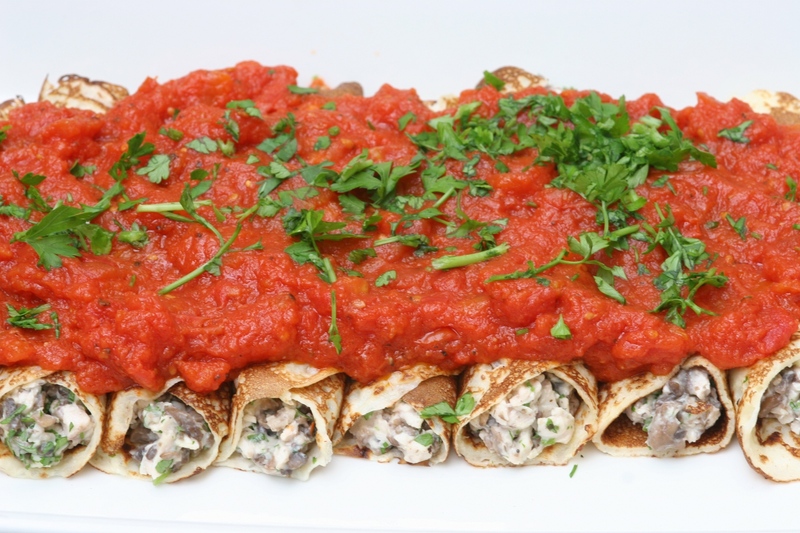 Place the pancakes side by side in the baking dish and cover with tomato sauce. Cover the dish with aluminium foil and bake in the oven for 40 minutes. Serve sprinkled with grated Parmesan cheese and finely chopped flatleaf parsley. It’s been a week of downs and ups since I last posted. The downs consisted of me being glutenated in rather strange circumstances which I’m still investigating. The suspected culprit is currently the food additive maltodextrin which was in a fruit bar masquerading as a gluten-free product. I’m still doing my research on the topic and I’ll do another post when I’m a bit clearer but I’d be interested to know if anyone else has had either a confirmed or suspected adverse reaction to maltodextrin. Anyway, on to the ups. 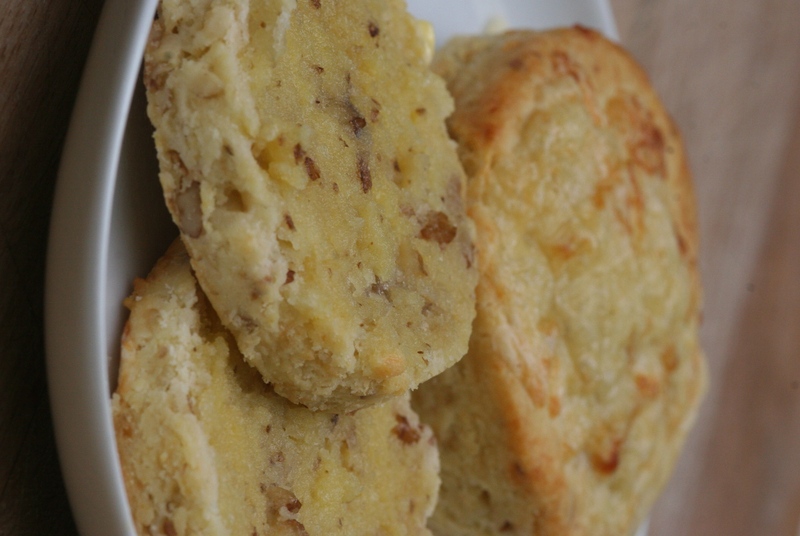 My very first guest blog post at LiveGlutenFree went live on Monday morning (April 30th). It was so exciting to see my recipe published on another site and to get so much positive feedback from Twitter and from visitors to the blog itself. If you haven’t discovered LiveGlutenFree yet, you should go and check them out. They have gluten-free recipes, information about gluten-free-friendly restaurants, advice for coeliacs, guest blogs (mine included!) and much more. 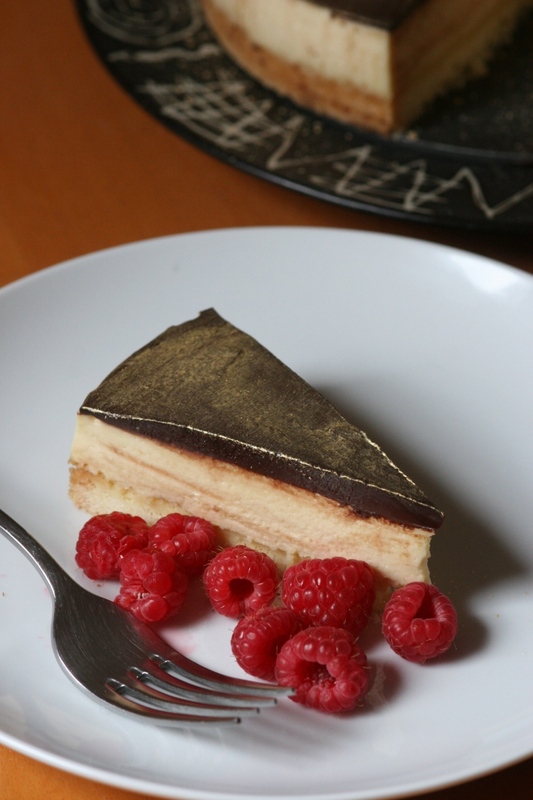 Last month’s recipe was Millionaire’s Cheesecake with Fresh Raspberries, inspired by a packet of gluten-free caramel slices kindly brought round to our house by a visitor. If the look of it has tantalised your tastebuds, do click on the link and have a gander at the recipe. I’m now busily thinking up what this month’s recipe is going to be! But enough of the self-promotion 😉 … on to this week’s recipe!! Everyone’s got a wok, right? Um, no. I DID have one once. A beautiful, brand-spanking-new non-stick one that my Mum and Dad gave me for Christmas. I brought it home full of big ideas about all the sumptuous Chinese banquets I would cook. I in fact used it just the once to make a stir-fry. My flatmate (strange girl) decided to do the washing-up. I looked over her shoulder to see her SCOURING it with a BRILLO PAD. RIP beautiful new wok. I haven’t had one since. 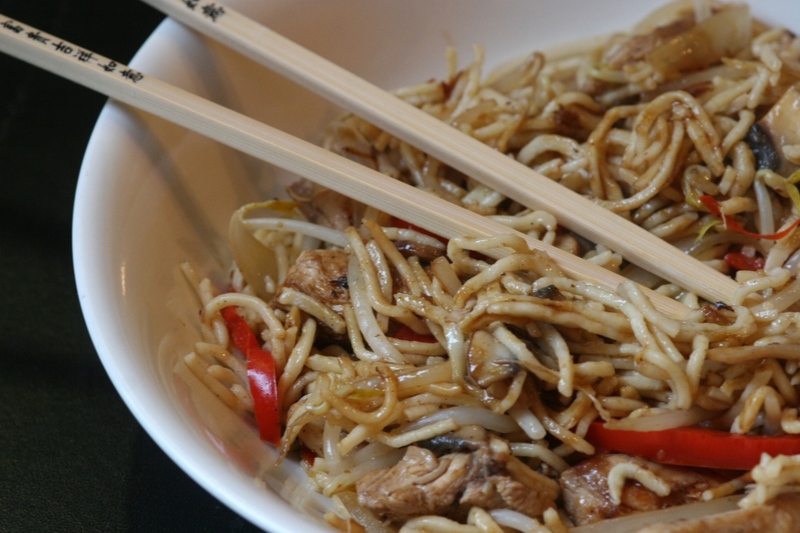 If I ever fancied Chinese food, I’d just go to the takeaway…then gluten decided that it hated me and that particular avenue of gastronomic pleasure was shut off. I’ve never been to a Chinese takeaway since to attempt to order anything gluten-free. I just think that there’s probably too much rogue soy sauce splashing about to be worth the risk but I’d be really interested to know if anyone else has tried it. If I want anything vaguely ‘Chinese-style’, I have to cook it at home now with gluten-free tamari. My egg noodle recipe is a variation on my pasta recipe – after all, you can’t really get as much as a cigarette paper between the difference. I did, in my research, however, discover that Chinese egg noodles are chewier than Italian pasta because alkaline, or lye, water (which is sodium carbonate and NOT to be confused with sodium BIcarbonate) is added. This, however, can be toxic if you don’t know what you’re doing. 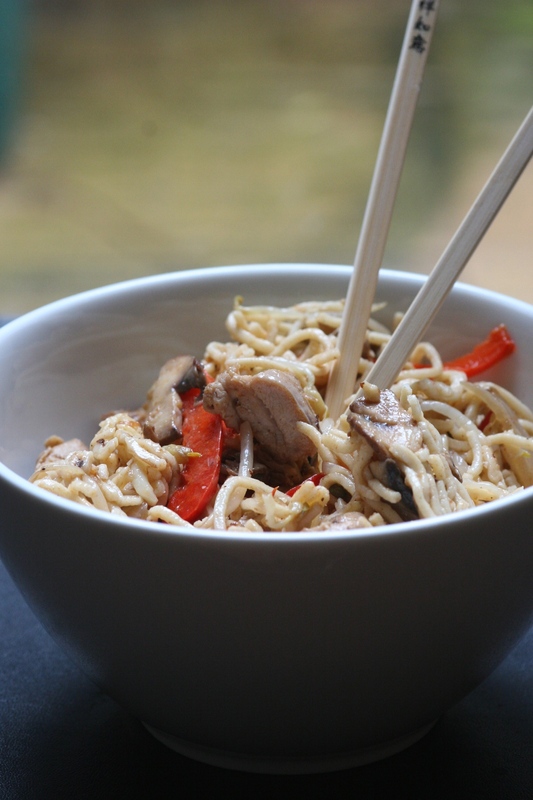 Nice… So I’ve made my noodles chewier by increasing the starch-to-flour ratio and adding a smidgen more xanthan gum. Seemed to work! You will also need a pasta rolling machine with a spaghetti attachment (mine came from Lakeland) and a wok or large non-stick frying pan (don’t use non-non-stick because the cornflour-coated chicken WILL stick to the bottom and burn). First of all, place the chicken in either a Ziploc bag or a plastic container with a lid, along with the Chinese 5-spice and tamari, seal and shake so that all pieces are coated. Leave to marinate. Then, make the noodles. Cut a strip of greaseproof baking paper about 30cm long and wide enough to fit underneath the rolling machine. You will need this when cutting the noodle dough with the spaghetti attachment. Put the dry ingredients into the bowl of the food processor. Blitz for a couple of seconds to mix the flours and break up any lumps. Add the two eggs and both oils. Blitz again to combine and gradually add a little cold water through the funnel until you have a soft dough. Tip the dough out onto an unfloured work surface and knead into a ball. It should be soft and sticky and feel quite light and pliable*. Now either wrap the ball in clingfilm or return it to the bowl of the food processor and put the lid back on to keep the noodle dough from drying out. Place a large plate dusted with flour next to the rolling machine. Working with a tomato-sized piece at a time, roll the dough out on an unfloured surface with a rolling pin until it is a few millimetres thick. Try to get either the width or the length approximately the same width as the pasta rolling machine. Pass the dough just once through thickness setting 3**. Make sure you carefully support its weight with your free hand. Dust each side of the sheet of dough with flour*** and make sure that the greaseproof paper is in place underneath before putting it through the spaghetti attachment. Slide the greaseproof paper out from under the machine and tip the noodles onto a plate. Repeat until all the dough is used up. Put a large pan of lightly-salted water on to heat. When the water has reached a rolling boil, add a handful of the noodles****. The noodles will float to the top almost immediately and the water should very quickly return to the boil. Allow the noodles to bob about on the surface for about 30 seconds and then start scooping them out into a bowl (I use a spaghetti spoon – I think they might also be called kitchen spiders – over a wad of kitchen roll so that they drain properly). Add a drizzle of toasted sesame seed oil and toss through so that they don’t stick. Continue cooking the rest of the noodles in batches and dress with oil. Cover and set aside to cool until ready to cook the rest of the chow mein. When you’re ready to cook the chow mein, add the cornflour to the marinated chicken and stir until all the pieces are coated. Heat the oil in either a wok or a large, non-stick frying pan (skillet). When the oil is very hot, add the garlic, ginger and chilli (if using). Stir quickly to avoid burning for about 30 seconds and then add the chicken. Brown the chicken for a couple of minutes, stirring constantly. Next add the onion and red pepper and continue to stir for another couple of minutes. Then add the mushrooms and continue to cook for another minute. Next, add the tamari and a couple of tablespoons of water to form a sauce and stir for another minute. Then finally add the beansprouts and noodles. Cook for another minute or so until the beansprouts have started to wilt slightly and the noodles are heated through. Serve with extra tamari for drizzling. * If the dough is sticking, flour the work surface and knead the ball of dough. Then break the ball up and return it to the flood processor. Blitz into small piece to distribute the flour more evenly, tip back onto the surface and knead into a ball. Likewise, if the dough is too hard and dry, break the ball up and return it to the food processor. Blitz into small pieces and add a little more water. Once it has come together again, tip back out onto the work surface. *** This is really important because it will stop the noodles from sticking and clumping together. **** I cook the noodles in small batches – this allows the water to quickly come back up to the boil and avoids the noodles becoming overcooked. This isn’t quite the post I was planning. I’ve been toying for a while with a salmon and pesto en croûte made with gluten-free puff pastry and I thought that I was going to iron out some irksome problems with it this weekend. Unfortunately, this was not to be. I did at least manage to avert the bane of most bakers’ lives – the dreaded soggy bottom – with a judiciously applied pancake (à la Beef Wellington) and although it tasted delicious (even my glutenista of a husband thought so!!! ), it was hardly photogenic. I’m not vain on my food’s behalf but, I think that if you’re trying to entice people into going to all the trouble of buying ingredients and cooking them, then a decent photo goes a long way. But I couldn’t cook it again so soon. 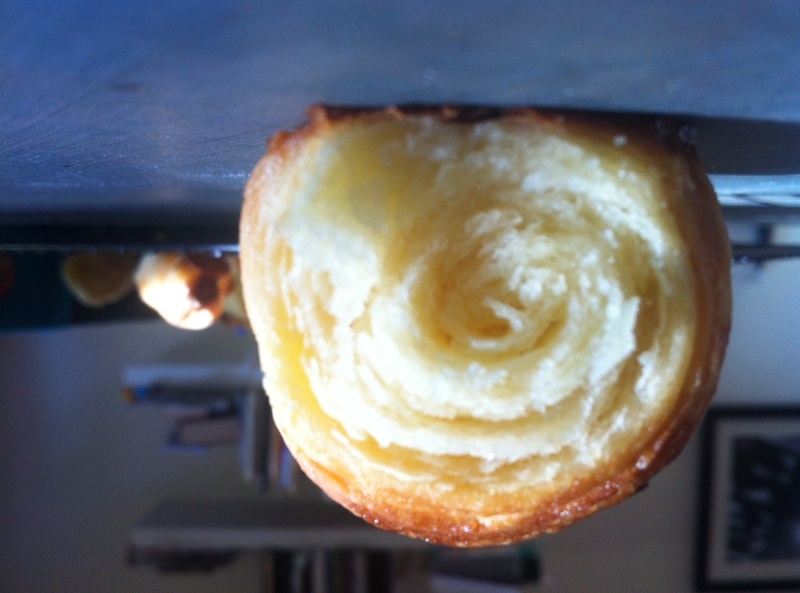 Even I can’t eat that much puff pastry in a week, gluten free or not. So I had no recipe to post that I was entirely happy with. What’s more, I had no dinner planned for yesterday evening either. 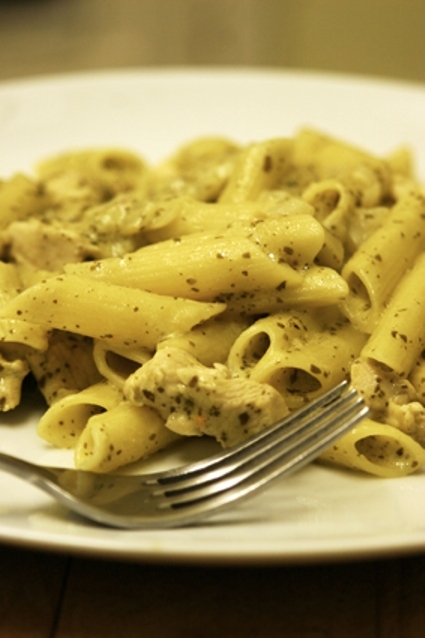 What I did have, though, was the rest of the tub of pesto, some crème fraîche and some pasta. All it needed was a quick trip to the supermarket to procure some chicken and, hey presto, the following dish was born. Truly serendipitous. I love it when a non-plan comes together. Heat the olive oil over a medium heat in a large, deep sauté pan (it needs to be big enough to hold the sauce and the pasta combined). Add the onion and gently fry until softened but not coloured. This should take about 5 minutes. Add the chicken stock and simmer gently for another couple of minutes. 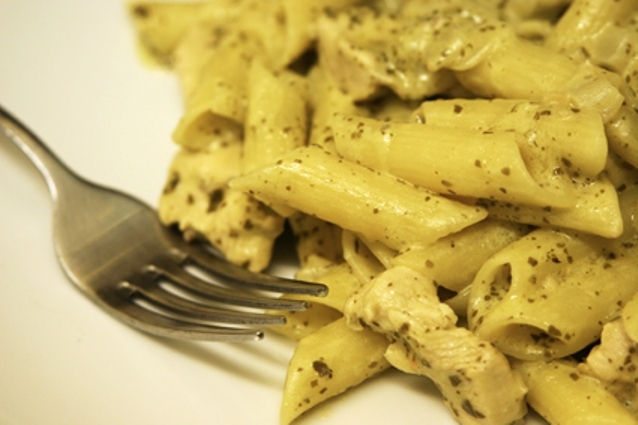 Stir in both the pesto and the crème fraîche and bring back up to a simmer. Add the chicken and allow to gently poach in the sauce for 10 minutes or until cooked through*. Meanwhile, cook the pasta according to the packet instructions in a large saucepan of boiling salted water. When the pasta is cooked, drain and add to the sauce. Stir to combine. Serve topped with freshly grated Parmesan cheese and a green side salad. *I always cook chicken breast in a sauce in this way to avoid the meat toughening up and going stringy. You could substitute chicken thigh meat for the breast but I would brown this off first, remove from the pan before cooking the onions and add back in once the sauce is made. It may not need such a long cooking time. For several years I lived with pounding headaches, aching joints, a runny nose, fatigue and digestive problems on a daily basis. I popped painkillers as though they were Smarties and had a stash of mentholated 4head sticks on the bedside table, in coat pockets, at the bottom of bags and at the back of desk drawers. The thing is, I didn’t really question what was causing all of this discomfort. I just assumed that the stresses of a long commute and a day of teaching secondary school pupils with learning, emotional and behavioural difficulties were grinding me down. I left the job but the symptoms persisted. I would wake up in the morning, feeling absolutely fine but, half an hour after a wheat-packed breakfast, I would get that expanding, burning aching in my head which would start at my temples, spread to my throat and make me feel queasy. I would automatically reach for the co-codamol whilst furiously smearing my forehead with menthol. It wasn’t until I decided that it was time I lost the stone and a half of excess weight that I’d been carrying around for far too long and went on the South Beach Diet, which cuts out gluten-containing foods, amongst others, for the first fortnight, that I found out, quite by accident that I was gluten intolerant. On my doctor’s advice, I’ve recently decided to find out if I’m actually coeliac or not. The diagnosis will make little difference to my everyday life, however. I’ve eaten gluten-free for the past two years and haven’t looked back. I’ve never felt so well. And the only thing I now eat like Smarties are, well, Smarties. The taste of the cumin and the lemons take me back to a restaurant overlooking Jemaa El-Fna in Marrakech where I first had a chicken, olive and lemon tagine. Preserved lemons have a fairly strong, medicinal flavour which I love but which isn’t to everyone’s taste. The first time I cooked this recipe, I put in two lemons and the flavour was quite over-powering. The second time, I only used one. The flavour is now far more subtle. I would imagine that a fresher lemon flavour could be achieved through the substitution of preserved lemons for the juice of a fresh one and the zest of half of it. Serves 2-3 (We usually manage to eat the whole thing between the two of us, but then we’re just plain greedy). Gently toast the flaked almonds in a dry frying pan over a medium heat until golden brown. This should take about 1-2 minutes. Remove from the pan and set aside in a small bowl. Carefully wipe the hot pan with a piece of kitchen roll to remove any shards of almond and return to the heat. Now gently toast the cumin seeds in the dry pan, still over a medium heat, until they become fragrant. This should take about a minute. Remove from the pan and grind to a powder, using a pestle and mortar. Return the pan to the heat and pour in the olive oil. When hot, add the onions and cook until soft but not coloured. This should take about 7-8 minutes. Add the cumin powder to the onions and stir. Allow to cook for another couple of minutes, stirring to avoid the onions and cumin sticking and catching. Add the rice to the pan and stir until all the grains are coated and glistening with oil. Add about 580ml of the stock and bring the mixture up to a simmer. Add the preserved lemon to the pan and allow to gently bubble away for about 5 minutes. Add the chicken pieces and the quartered artichoke hearts to the pan and continue to simmer until the rice is tender, the chicken is cooked through and all the liquid has been absorbed. If the rice absorbs all of the liquid before it’s cooked, add more stock, a ladle at a time, to keep the mixture moist. This should take about 10 minutes. Check the seasoning, adding pepper, and salt if required (I find that the stock has plenty of salt in it and I never need to add more). 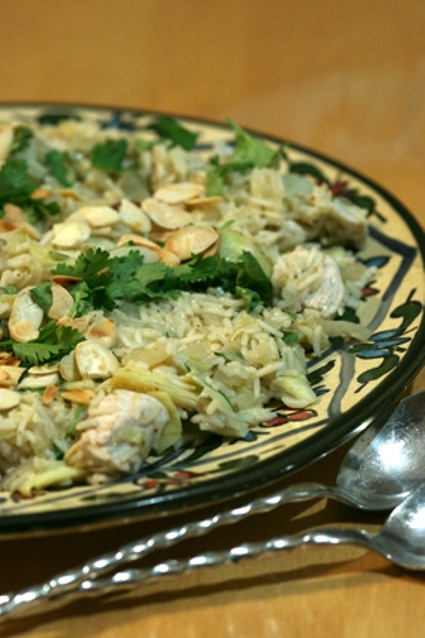 Stir half the coriander into the rice and scatter the remainder over the top, along with the toasted flaked almonds. Serve with a green salad.